The ORC is a very fun blog link-up sponsored by the awesome Linda of Calling It Home. When you have a little time, grab a cup of coffee, go here, and browse the dozens of room makeovers, all happening in the span of six short Thursdays!! The project I decided to tackle is our deck. We've been in our house for more than five years and this space has been neglected pretty badly. I work best with a deadline and decided this accountability was just what I needed to create a usable, pretty and welcoming outdoor space. I know it doesn't look like much has happened, but trust me when I say that things are moving behind the scenes! Tonight, we're going to pick up a beautiful rattan sofa (found on Craigslist). This will be the largest piece both in size and investment -- this is very much a 'budget' project, and for the most part, everything else is thrifted, diy'd or taken from my stash. I've been on the hunt for an outdoor sofa for this space for weeks, and good looking, affordable versions are not easy to come by! It comes with cushions (bonus!) which will need to be recovered. I'm thinking I'll most likely do a temporary fix for now and properly reupholster down the road. The above shot is from yesterday when I was playing around with furniture layout options. The sofa will most likely go against the black fence on the left, with the bamboo shades hung over it. I'm still considering a few other furniture arrangement ideas… I'm torn because the huge empty space to the right is what you see from our living room windows, so in a sense I'd love to have this be the main, decorated living space. But…the back nook (what you see above) is really suited much better for this. In the larger space, there's not really a place where the sofa would naturally go. Once we have it, I'll try it in a few different spots before making my final decision. Can I just say… I AM SO EXCITED TO FINALLY HAVE SOME COZY SEATING OUT HERE!!!! Woooooo hoooooo!!!! This is me playing around with fabric choices. Also trying to figure out the best spot to hang the art, given the lovely pipe running down the middle of the wall. And, yay! Real progress! I've been really drawn to olives greens lately and have been wanting to incorporate somewhere. Given my goal of keeping this space a bit less multi-colored than the inside of the house, I decided to use it on two sets of chairs. The dining chairs have been in our basement for awhile (since they were replaced with different ones), and I'm excited about giving them a new life. They're really solid metal, and I'll recover the seat cushions with something durable. We won't leave them outside most of the time, but they'll be great for the occasional outdoor meal, entertaining, extra seating. The plastic ikea lounge chairs, I just wasn't ready to part with. They were a craigslist purchase a few years ago, and are just so trusty! No need to put them away or cover them. Throw a pillow down and they're perfect for curling up with a magazine on a sunny day. I tried to use the least 'ikea-ish' color possible… pretty tricky, right? ;). This is real time! Today, the house painting is being completed. The window frames are all black, which sounds so minor but makes such a huge statement. I LOVE it. Can't wait to share. 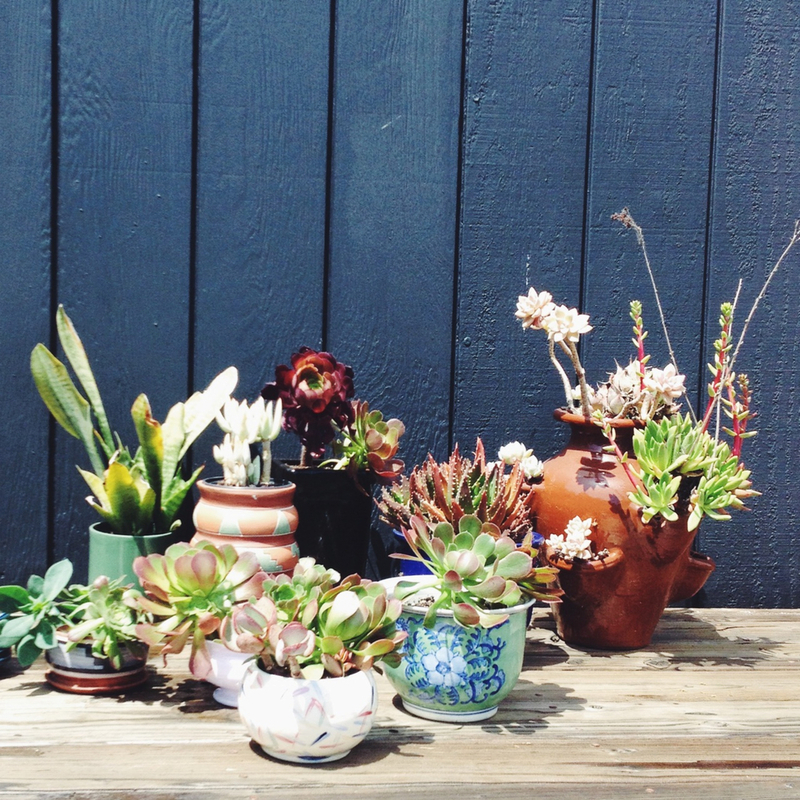 While the painters are painting, I'm repotting a bunch of succulents. I had a huge one that had completely outgrown its pot, and is making so much more impact as a bunch of smaller ones. Pretty! And…my biggest challenge is still before us. Will I be able to create some kind of screen to mask the messy lot next door? We shall see! Thanks so much for coming along on this adventure. I'm so excited to see this space come to life over the next few days, and then share it with you!